Disturbia is the latest teen "thriller" movie to land on DVD which begins humbly as the viewer observes a touching scene between a father and his son that ends horribly in a dangerous car crash. Fortunately for Kale Brecht (Shia LaBeouf), he is the only survivor of the accident and blames himself for the death of his father. As Kale's life changes (for the worse), he soon becomes involved in a variety of delinquent crimes and is sentenced to house arrest for three months. In order to break this boredom, Kale spends his time spying on his neighbours. Kale soon believes or so he thinks a dark secret of one of his neighbours and he enlists the aid of his friend Ronnie (Aaron Yoo) and the attractive next door neighbour whom he has also been spying on Ashley (Sarah Roemer) who attempt to unlock the secrets of Mr. Turner. Disturbia is your typical teen horror cliché that younger teen viewers will enjoy with these angst ridden teenagers. This movie could almost be considered "Rear Window" for teenagers but unfortunately fails to deliver the true suspense that only Hitchcock could create. 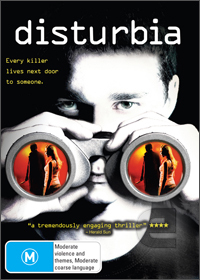 Definitely recommended for the teenager or for those viewers that cannot watch gory horror movies as Disturbia is quite light on this aspect.